I’m falling behind, guys. Of the 34-or-so Valdemar(ish) books out there, I’ve read only 20 to date. So when I saw an anthology set in the world of Mercedes Lackey, it was a no brainer. Of course I had to read it. Creepy cover notwithstanding, this was a 387-page anthology full of 22 feel-good story resolutions via 23 different authors (the last story being Lackey and Dixon’s work). The tempest theme appeared throughout, both as physical and emotional storms, as each author made that light nod to the world of Velgarth. The stories included heralds, healers, bards, companions, and even a couple non-human characters. My quest to read something by Elizabeth Bear started a little over a year ago, and it’s been riddled with false starts. First, I ended up grabbing Trading in Danger (by Elizabeth Moon). Then Dust was nowhere to be found. 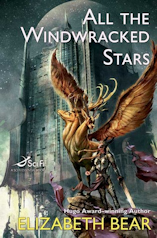 Then I got All the Windwracked Stars (isn’t that a stunning cover?) but couldn’t find the time to read it. Seeing Shoggoth’s in Bloom up for grab was serendipity, and I went into this collection to get a sense of what Elizabeth Bear can do – in small, bite-size pieces. In Russian fairytales, the firebird is a kind of glowy Gandalf who helps the main character overcome man-eating wolves, immortal evil overlords, and overprotective fathers. She is not to be confused with a phoenix (depicted to the right), a Middle-Eastern (and/or Greco-Asian) mythological creature that rises from the ashes every time it croaks and appears in the Harry Potter books to grant the main characters a variety of minor cheats. 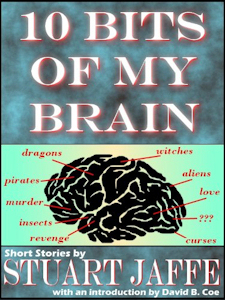 Jaffe is a versatile writer whose stories span genres and settings, without ever making the editor and reader in me cringe or groan. The offhand manner of narration edge stories like Henry’s Son with their very own menace, while With The Three Fingers Case, Jaffe takes the reader on a romp into a quick homicide mystery–the catch? The dragon detective thinks a human did it, and his human partner is sure a dragon’s to blame. Over the course of the stories I saw witchery, voodoo, curses, and pirates (see book cover over to the right for a more complete list!). The collection begins at the height of the holocaust in Nazi Germany, then moves to a tattoo parlor at the edge of the universe, then to a small park bench where a homeless man idles his days away. Though the pieces differ wildly in plot and genre, I sensed a few common threads I thought could have been emphasized to unify the tales. For example, life is something to be endured by the characters, and death is often a release. I don’t want to call these stories nihilistic, but there is a certain acceptance and even longing for the inevitable closure to the arc of life. Immortality, as it comes to at least two of the characters, is no gift, and betrayal usually comes in the form or a relative or friend.